We shall argue that Abstraction is not a mathematical but a physical activity. It's already done by our senses. Our eyes can see the light, as it is casted back from a piece of paper. The same piece of paper can be felt by our fingertips. And when it is crumpled up, the sound of it will be heard by our ears. But eyes cannot hear sound, fingertips cannot see light. All these single perceptions of our senses have to work together. And even if we are not handicapped, the end-result is still an abstraction of reality as a whole. None of our senses is capable, for example, to see ultraviolet colors, as some insects can. But why should attention be restricted to the creations of Nature? Why not take a look at our own creations: human made Technology? Some cameras are capable to "see" in the infrared domain. Our radio telescopes are even capable to "see" the radiofrequencies of far away galaxies. Far more common and well-known everyday abstractions of reality are performed, however, with measuring devices like rods for the abstraction of lengths, clocks for the abstraction of time intervals. But these measuring devices have become more and more self supporting these days. When coupled with digital computers, human interaction is hardly needed anymore. An example is the well known device for the abstraction of weights: the balance. It's further development has resulted in the fully automated Mettler Balance, which is only one of the many examples though. All the apparatus make an abstraction of reality, which is thus a physical and not a mental process, let it only be that it would be mathematical. From the Mettler balance example, we see that abstraction results in numbers. Let us not be bothered by the question whether these numbers are numbers in a mathematical sense. Likewise it is assumed that the outcome of an abstraction can be another rudumentary mathematical object, like for example a naive "set". Or even a complex number - as far as the latter is concerned, suppose that our measuring device returns an ordered pair or real numbers. And let us not forget geometry. Many laboratory devices come with a screen for displaying graphs. Among the more advanced possibilities offered by modern instruments is three dimensional modelling of the data received. The possibilities only seem to be limited by lack of imagination. It doen't seem very wise to exclude anything a priori and it's better to decide not to do so either. In short, we consider any "primitive mathematical notion" as a possible product of abstraction, which is thus a product of physics, not of mathematics. Before proceeding any further, something has to be explained about a nasty habit of some, (if) not all, theoretical mathematicians. I want to talk about their systematical disdain for that continuing activity of physicists, called measuring. Let it be stated firmly that those theorists, in general, don't understand quite much about performing experiments in the real world. Especially, they are not very much aware of the fact that there exists a highly fundamental phenomenon out there, which is inevitably and intimately related to any physical observation of the continuum, inasmuch as to any realistic abstraction from it: the quite limited accuracy of any measuring equipment. Always resulting, not in one, but in several, distinct numerical values. For one and the same physical quantity, we find a whole range of rational numbers, instead of just one real. It is common practice to replace that range by a mean value and kind of a deviation from the mean, called the measurement error. But the word "error" alone seems to sound already most frightening to some. Yet the whole secret of the continuum is in the error accompanying the rational numbers, when abstracted from reality. But, errors with rational numbers are by no means the exclusive intellectual property of physicists. Not anymore. Because, with the advent of digital computers, mathematicians have become experimentalists too ! Almost every mathematician has a personal laboratory at his disposal these days. And - not surprisingly - with these digital working places, the same kind of erroneous behaviour is experienced as within the laboratories of physicists. Computers have turned Mathematics into a die hard empirical Science. Meanwhile, many mathematicians have learned to live with the limitations of the apparatus. They have learned how to cope with roundoff errors, error propagation and the conditioning of matrices. They have learned how to clip straight lines against the finite size of a window. To name only a few of the hurdles that had to be taken in the early days of digital computing. However, physical experiments do not constitute a physical theory. And mathematics cannot be reduced to just the MatLab. It is precisely here that idealization comes into mind. Yes, Idealization could be characterized as the true mathematical activity. What is an idealization? Our answer: Idealization is where infinity comes in. Among the most classical examples of idealization, without doubt, is good old Euclidian Geometry - and perhaps it's even better to consider geometry in its original setting: classical Greek philosophy. Remember utterings like: a point has no size, a line is infinitely thin, parallel lines intersect at infinity. The whole concept of an irrational number wouldn't have emerged if Euclidian geometry hadn't been there in the first place. Yes, geometry is a playground par excellence for infinities. Yet, strangely enough, among the most challenging idealizations are not found in pure mathematics, but in theories of Physics. Most famous are the idealizations called Gedanken Experimente (Thought experiments which were carried out by Albert Einstein in order to establish the basic foundations for his (Special) Theory of Relativity. In "The Theory of Heat Radiation" by Max Planck, Wien's Displacement Law (chapter III) can only be derived under the following conditions: if the black radiation contained in a perfectly evacuated cavity with perfectly reflecting walls is compressed or expanded adiabatically and infinitely slowly. Idealized Carnot engines are used in Thermodynamics for defining that stunning but indispensable quantity, called Entropy. And the list goes on and on. How about ideal, frictionless movement in mechanics? How about ideal pendulums, which can only exist through a sine with (almost) zero amplitude. As soon as physicists have devised their mathematical model, then it can be said that idealization has been accomplished a great deal. One should become alerted as soon as the following phrases are being uttered: "perfect", "ideal", "zero", but especially "infinitely", like in "infinitely slow" or "infinitely thin". It can safely be concluded, indeed, that the following is true. Idealizations are invariably associated with Infinities. Since we have established too that mathematics begins with idealizations, it might be clear - finally - that this discipline, most probably: cannot do without them. Far-fetched as some of them might seem, there is one thing which distinguishes idealizations in Physics from idealizations in Mathematics. It is given by the requirement that there should always be a correspondence between the physical theory and physical experiments. With other words: the process of idealization, in physics, must also exist the other way around. We shall give a name to this inverse process of idealization and call it: MATERIALIZATION. A little bit of Physics would be NO Idleness in Mathematics. Thus we see that Idealization, as has been conceived by Plato and others, is not so much wrong, but merely incomplete. It's not enough to idealize things and stay there, in the heaven of Mathematics. It should be possible to invert the whole process, as well. There must be a bijection. Idealization must always be accompanied with materialization. Besides that Stairway to Heaven, there should always exist a Way back to Earth. Mathematicians, too, must go back to earth: iff they find it worthwile to know that what they think may be labeled as scientific knowledge. And all this, of course, associated with unlimited processing power. Look how "easy" it is to formulate the goals of idealization with nowadays technology in mind ! Nevertheless, these goals have been around for quite a while. Ever since the Ancient Greeks formulated their idealized, Euclidian version of Geometry, to be precise ! Meanwhile, good old geometry certainly has found its culmination in nowadays computer animation, employed extensively in movies and games. But let us not be distracted by the achievements of Modern Times so quickly. After some thought, it becomes evident that the three idealizations - unlimited # words, bits and processing power - cannot live without each other. It may be concluded that the idealizations which are needed with pure mathematics are involved a great deal with the infinite, in (computer) space and time. It may also be concluded that people cannot idealize one thing (integer numbers) without the other (floating point numbers). Therefore the Science of Mathematics is condemned to idealize everything. Or nothing at all and stay primitive forever. With the above in mind, it's easy to see how the reverse process of idealization, materialization (not to be confused with nonsense like this), may be realized with pure mathematics. Simply replace the infinite memory (and infinite processing power) of their ideal computers by the finite memory (and finite power) of real machines. Sounds good, but, to be honest, it's not as simple as that ! Bringing pure mathematics back to earth has given rise to brand new areas of investigation, such as Numerical Analysis and Computer Graphics. From my own experience, I can confirm that being involved with subjects like NA and CG is a highly non-trivial occupation. The mere requirement that materialization should be possible doesn't mean that actually doing it would be a nice and easy task, to be accomplished in five minutes. But, materialization being difficult is not the same as: finding that the way back to earth comes to a dead end altogether. If the practitioners of Pure Mathematics are allowed to pick up their ideas out of the blue sky, then it cannot and it will not be guaranteed that materialization is possible indeed. This makes pure mathematics vulnerable to the criticism that some of its ideas may not be useful, meaning that there is no way, at all, to turn them into a useful application. These ideas just end where they are. They are doomed to remain ideas. There is no way back to the abstractions and, via the abstractions, back to the real world. 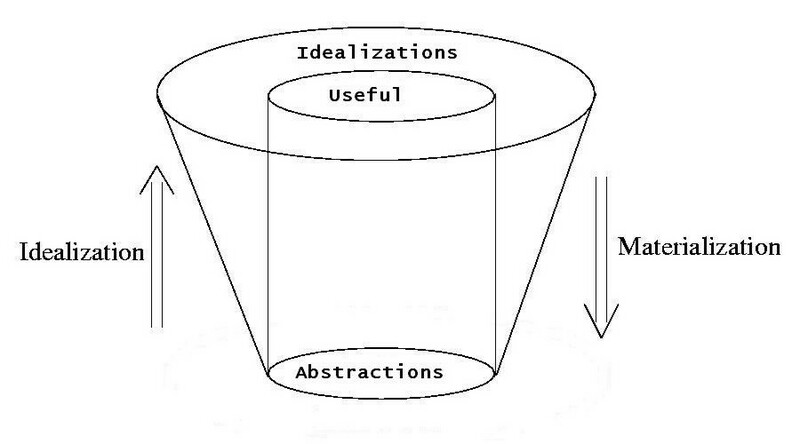 Idealizations which can be materialized. They constitute the useful parts, Snippets of Pure Applicable Mathematics. Idealizations which can not be materialized. Deemed to be useless, it seems, for now and for all centuries to come. The one and only reason for Infinities to exist is the act of Idealization. Conclusion: Infinities do only exist as Idealizations in the human mind. There is only one way back to Earth. Away from the idealizations, back to the abstractions. Away from the infinities, back to the finite. And that must be: away from exact and re-introduce the errors. This is the subject of a separate web page: Renormalization. Laboratory. Or material reality. Here it is where our computers live in. And program development. Number Crunching activity is all over the place. The numbers here appear in two flavours: 32-bit integer and 64-bit floating point. There are a few exceptions to this rule, but they are rare. Experimentation also takes place here, like finding large prime numbers for the purpose of encryption. But all kind of physical measurements as well. Abstractions. Here is the place where all Scientific Theories start. Sometimes they stay here forever. There is also quite some mathematics here, especially finitistic mathematics. Like Turing machines, computable functions, a lot of Number Theory, Galois Fields. The whole machinery of Constructive Mathematics (and maybe Intuitionism as well) is living here. Logic may be quite different from the standard at this place: the law of excluded middle is questionable. Numbers have a finite precision, but this precison can be much larger than can be realized in any conceivable computer. And, oh yeah, all of the infinitesimals, as employed for example by physicists. are to be conceived as abstractions. They will only become idealizations - and only eventually - in a later stage (e.g. when they become part of an integral). Do there exist mathematical theories that will never reach the stage of being an idealization? There are! For example infinitesimals in e.g. Thermodynamic equations, like in e.g. T.dS = dU + P.dV , are "waiting" for an integration procedure, before they become "mathematical". Many mathematicians would argue that they are mathematical because they are "meant" to integrated, but nobody knows what it means to say so.